These Pork Crackling, Lemon and Fennel Swedish Meatballs are deliciously creamy and cosy, best served with a generous helping of mash and a mound of greens. The most important ingredient in these meatballs is the addition of pork crackling. I’m sure that I read somewhere that this is how a famous chef makes his meatballs taste so good but I can’t find any residual reference of that so I might have just made it up. Nevertheless it adds texture, flavour and fat to these meatballs which are wonderfully succulent, meaty, fresh with lemon and bright with fennel. The inclusion of the crackling also eschews the need for any breadcrumbs so you have gluten-free meatballs without really trying. You simply must save some crisp crackling for sprinkling over the top as well for added umami crunch. For this recipe you can go the long route and make your own crackling, as the method suggests below. However, if you want a bit of a shortcut in the recipe then feel free to buy the pork crackling in. Make sure it’s the really good stuff though and check the ingredients to make sure there’s no gluten involved. I ummed and ahhed over how to serve my meatballs; in a sauce not in a sauce. Then once I had decided on that yes, a sauce was absolutely necessary, I opted for the creamy delights of a Swedish meatball sauce. It was probably inspired by our trip to Ikea at the weekend where you can’t help but be deluged with images of Swedish meatballs as you are wandering, rather painfully, around the labyrinthine warehouse. Inevitably I only went to buy candles and napkins and I think we ended up in this other dimension for about two or three hours. Nothing like wasting your weekend away. 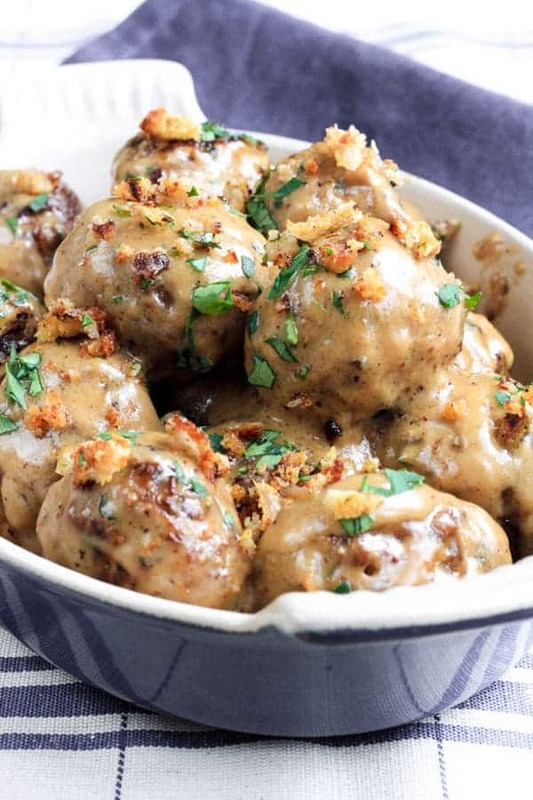 Swedish Meatballs are pure comfort food. 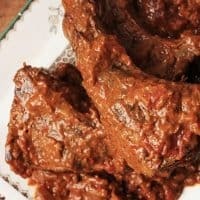 A simple gravy, imbued with the intense flavour of good stock, a bit of redcurrant (or cranberry) jelly for sweetness and then finished off with the creamy tang of crème fraiche. The gravy compliments the unctuous meatballs perfectly. They have so much flavour packed in that I just wanted the gravy to nest the meatballs not create a swimming pool for them, so don’t expect more than a couple of spoonfuls of sauce per serving. 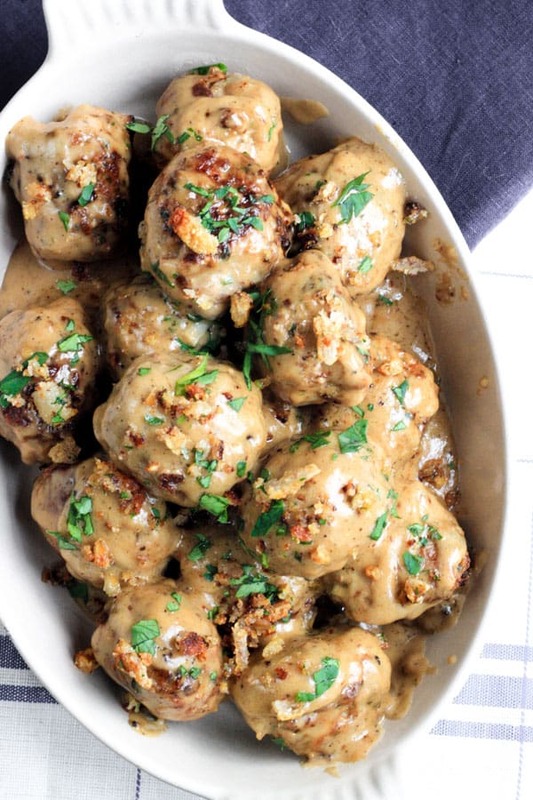 These meatballs are rich so I found that just to accompany them with a bowl of steamed greens and carrots was plenty but by all means I can only imagine the possibilities if you would like to serve these with a prodigious mound of mashed potato. Today this recipe seems a perfect fit for the wintry weather we are experiencing and I can think of nothing better than sitting down cosily later with a bowl of hot creamy meatballs whilst gazing upon the blanket of snow currently covering North London. If you are making your own pork crackling then the day before you want to eat your meatballs, prepare your pork skin by rubbing all over with plenty of salt and pepper. Place the skin in a wide saucepan and just cover with water. Bring to a gentle boil then put the lid on a leave to simmer for about an hour and a half. 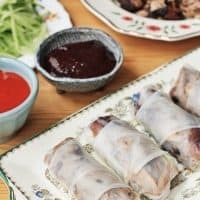 Remove the pork skin from the water and pat dry. Leave to cool before refrigerating overnight to completely chill. Slice the pork skin into strips. Then heat 1 tablespoon of olive oil in a wide bottomed saucepan and when hot, place the pork skin into it. As the skin turns into crackling it will spit a lot so clear the sides of anything you don’t want covered in oil and stand back. Fry for about 10 minutes on the first side and 3-4 minutes on the other side. Remove with a slotted spoon and leave to cool. Then chop finely. Reserve the fat in the pan for making the meatballs. Mix the ground almonds with the whole milk then cover and refrigerate overnight. If you are using almond pulp then you do not need to do this step. Place the diced onions in a medium saucepan with the butter and cook on a very low heat for about 20 minutes to half an hour until the onions are soft, golden and melting. Leave to chill in the fridge until completely cool. 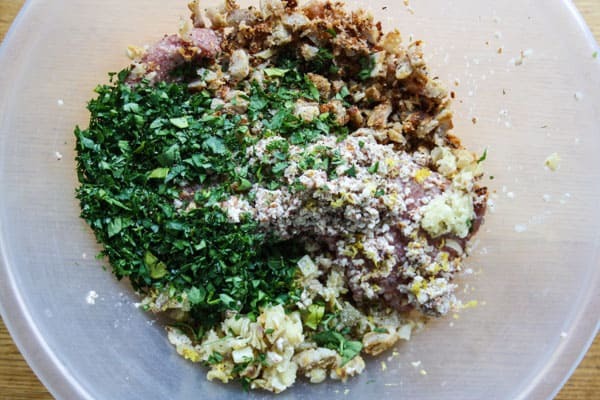 Mix the pork mince in a large bowl with the soaked almonds, caramelised onions, fennel seeds, lemon zest, garlic, parsley, thyme, about two-thirds of the pork crackling and an egg. Season then mix thoroughly with your hands until completely combined. 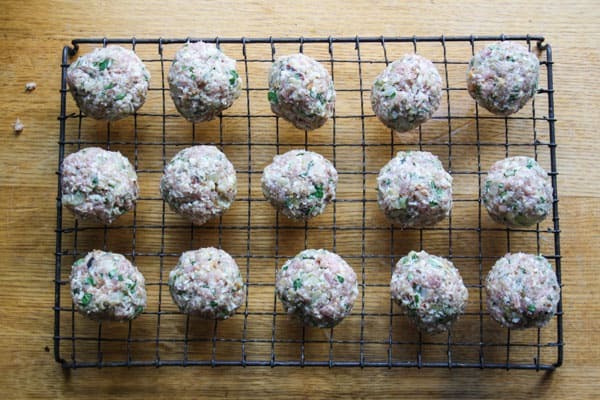 Shape into balls, about 50g each, and heat the pan with either 2 tablespoons of the reserved pork fat or olive oil. When hot, drop your meatballs into the pan and cook for about 3-4 minutes on each side. Remove the meatballs and set aside. Remove most of the fat from the pan, leaving about 2 tablespoons. Add the sweet rice flour on a low heat, stirring into the fat. Slowly add the stock, whisking into the roux until it’s all combined. Keep whisking as the sauce begins to bubble. Taste for seasoning. Add the redcurrant jelly and whisk through. Then add the crème fraiche and whisk into the sauce so it becomes thinner and smoother. Again, taste for seasoning. Place the meatballs back into the pan and coat thoroughly with the sauce. Cook for about 5-10 minutes until they are piping hot then remove from the heat. Serve the meatballs with the gravy and plenty of parsley and the rest of the pork crackling sprinkled over the top.